A new series of Disney comics with the undertitle English Edition just started. So far a couple of issues have been published in Germany and the first Norwegian issue will be in sale on Monday (Feb. 29). But other countries might follow ( ..just speculation from my side). In Norway 6 issues are scheduled for 2016. 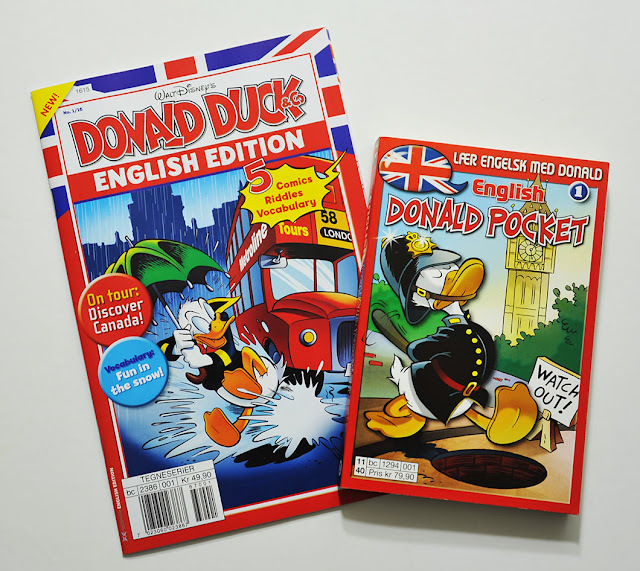 Pocket books in English have been published in both Germany, Norway and a couple of other European countries for a few years. They mainly contained Egmont 3-tier stories, with a few Italian ones inbetween. The new series however is in regular comic book size and have 4-tier stories. 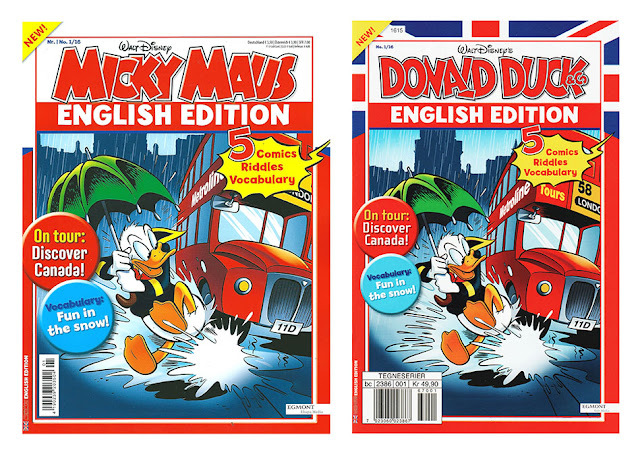 The first Norwegian issue had two Carl Barks stories and three "D-coded" Egmont stories previously not published in English. As the comics are targeted at people not having English as their first language, the dialogue might have been simplified a bit. Comparing the dialogue in the Barks stories, we can see that slang have been changed to more proper "school English"
But other than that, not much seems to have been changed. The comics also have selected glossary at the bottom of the pages. 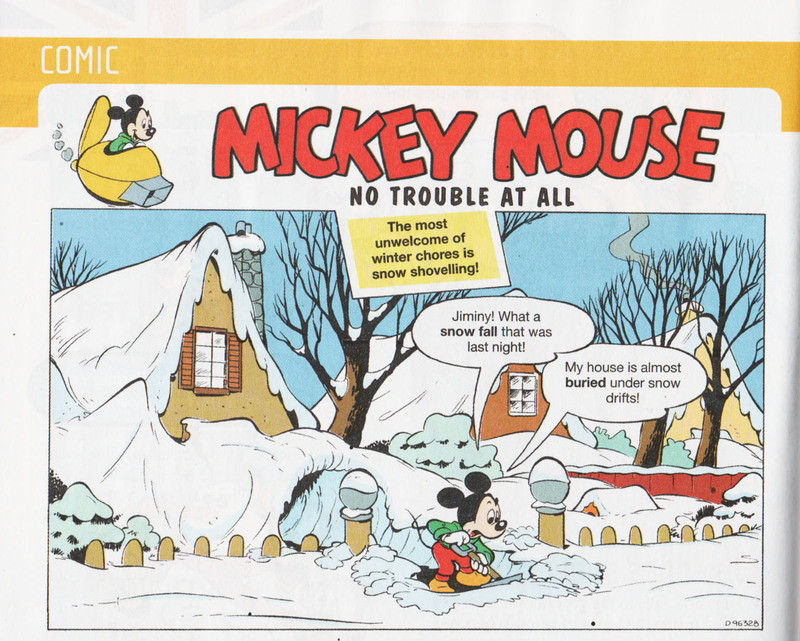 So, Noel Van Horn has inherited his father's affinity for snow-filled stories? I remember colorist Susan Daigle-Leach affectionately complaining about All That White. Thanks for alerting us to the new English-language series. I did buy a few of the earlier English Edition pocket books. First one I ordered was the one with Marco Rota's "The Return of Zampata Duck." I was particularly happy to get Laura & Mark Shaw's "The Hanged Man," which is an homage to the old Wonderful World of Disney live-action series "The Scarecrow of Romney Marsh," which I remember fondly from childhood. I will have to keep an eye on which stories they are printing in these new English Edition comics. The Barks stories in this issue can easily be found elsewhere and the rest is not interesting enough to justify using time and money trying to track it down (in my opinion). But future issues might have more interesting content. The German edition is probably the one that is easiest to find online. I saw a few copies for sale on the German eBay.